I was chin-deep in a bowl of spaghetti in a guest house in Lobuche, Nepal in April 2017 when I bumped into my good friend Lakpa Rita Sherpa. He was on his way to Everest with Alpine Ascents and their team preparing to summit Everest and Lhotse later that season. My friendship with Lakpa Rita and his family is a special one. Lakpa and I first met in 2012, working together as brand ambassadors for the global outdoor brand, Sherpa Adventure Gear. Lakpa’s image is the ‘face’ of the brand, and representative of its long-held Sherpa heritage forged deep in heart of the Himalaya. 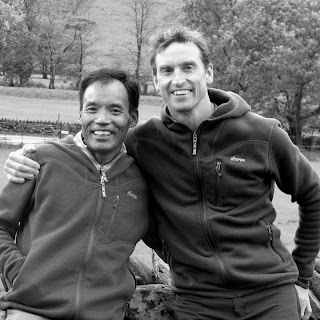 Through this connection, we worked together as colleagues on a fun lecture tour, "Everest Uncovered" delivered across the UK in 2013 with fellow Everest climber Kenton Cool and alpinist Ian Parnell. Our paths subsequently crossed on numerous occasions in Nepal including before and after the earthquake in 2015 and visits to Nepal throughout 2016 and 2017. Like so many others who have travelled under his leadership and benefited from his experience, I’ve learned a tremendous amount from Lakpa Rita both about climbing and life more broadly. 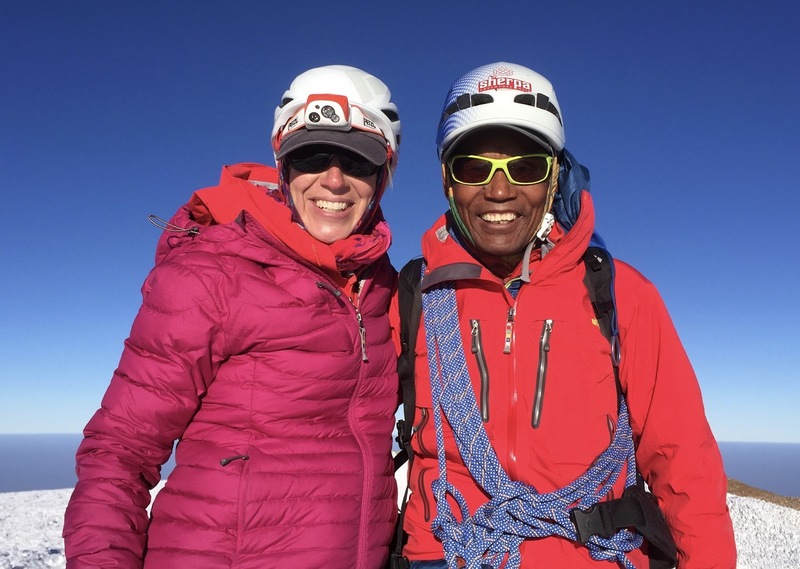 Raised in the Khumbu (Everest region) in a small mountain village of Thame, Lakpa Rita has been professionally guiding and climbing around the world for nearly two decades. In 2013 he was named one of Outside Magazine’s Adventurers of the Year. A deserving award reflecting his extensive climbing and guiding achievements - which include 17 summits of Mt. Everest on over 23 expeditions (well over 260 climbers reaching the summit under his leadership) seven guided summits of Cho-Oyu and numerous other peaks in Nepal. In 2009 Lakpa became the first Sherpa and first Nepali to climb the Seven Summits, climbing the highest peak on the 7 continents. Now, returning to that that fateful day in the lodge in Lobuche in April… With a steaming cup of tea in hand, Lakpa shared details of an exciting project, ‘Climb to Contribute’. For a change, the project didn’t involve scaling dizzying Himalayan heights, wearing down suits or suffering seemingly endless nights in a cold tent eating freeze-dried food… Rather, the project involved climbing to the 14,411 ft (4,392 m) summit of Mt. 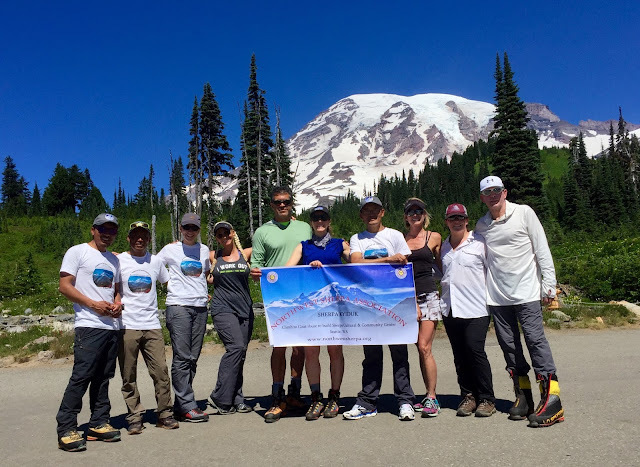 Rainier in Washington as a fundraiser for the North West Sherpa Association and support their ambition to build a community and cultural centre for the Sherpa community of the Pacific North West. I immediately pledged my commitment. 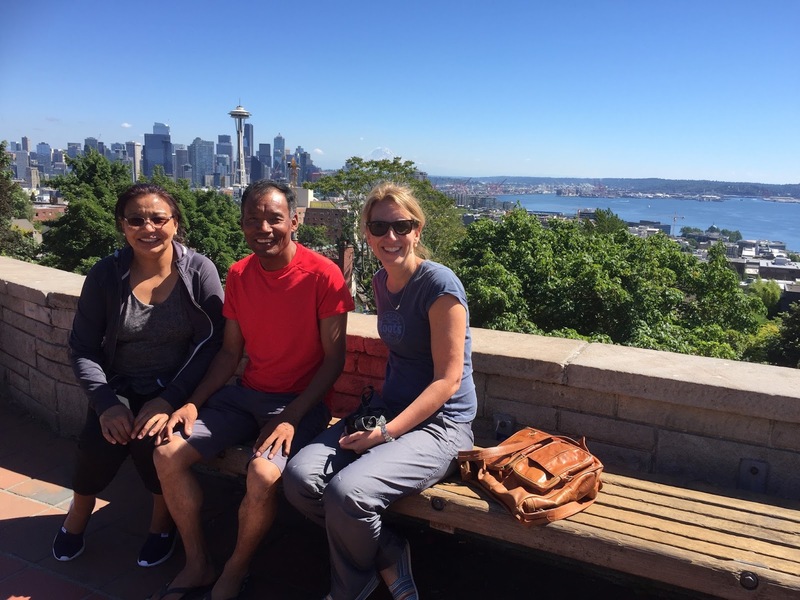 It wasn’t long before August rolled around, my duffel bags were packed and I was boarding a flight to Seattle, Washington. I was warmly welcomed to Seattle by the Sherpa family. Lakpa and his wife, Phurba treated me to the unparalleled Sherpa hospitality that I have come to know through the time spent in Nepal. Warm, authentic smiles, steaming cups of tea, lots of laughs and delicious meals focused on family, food, gratitude and compassion. Despite being thousands of kilometres away from Nepal, I felt like I was back in the country and felt instantly at home. I’m so incredibly thankful to have had this time with Lakpa, Phurba and their family and don’t even know where to begin to thank them for being such wonderful, gracious hosts. 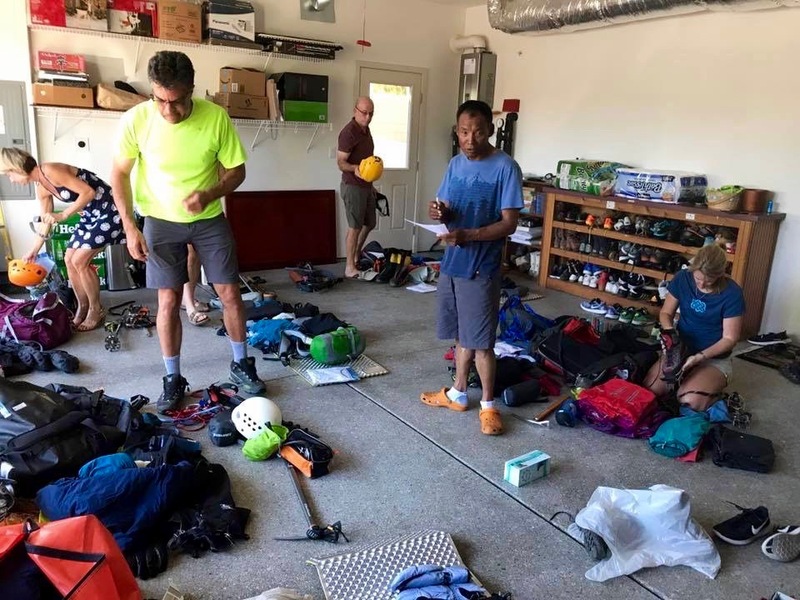 The day before we set out for the climb, the entire team met for a gear check at Lakpa’s house. It was great to meet everyone and exchange stories about our respective adventures in the hills and how we all came to learn about the Climb to Contribute project. There were many laughs as the team bonded over packing-checklists and the supporting mountains of kit spread haphazardly across the floor of Lakpa’s garage. No less than 24 hours later fully caffeinated and raring to go, we were in the parking lot at the base of Mt. 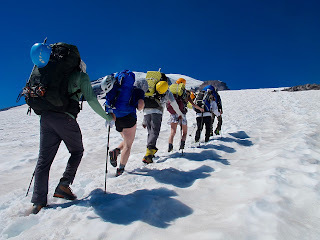 Rainier with packs strapped to our backs and taking our first steps to the summit. Here we also met our other two guides – the wonderful Lakhpa Gelu Sherpa and Jangbu Sherpa – both experienced guides and part of the Northwest Sherpa Association. It was unusually warm in Seattle that weekend. Rather than the standard balmy 23 – 25 degrees, the sun bore down on our heads at a scorching 30+ degrees. The heat was sweltering. Layers were quickly peeled off and litres of water drunk as we strained our necks beyond the horizon to see where we’d be pitching our tents for the evening. We reached our camp a hot 4 hours later. Tent platforms were quickly established and we set up our ‘home away from home’ for the next two nights. Alpine Ascents had kindly donated the use of their kitchen-tent so Lakpa quickly set off to prepare dinner while we put on warmer layers and watched the sun set. I shared a tent with my good friend Christa who had joined me on the trip from her hometown of Sudbury. 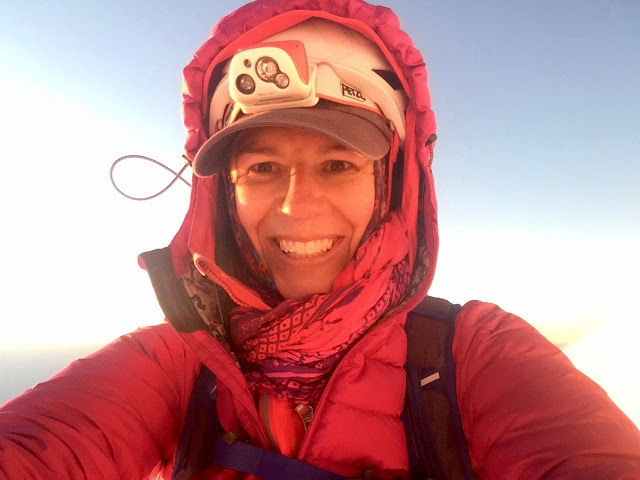 We were both giddy with excitement - it may sound ‘cheesy’ but I absolutely love being on expedition, sleeping in a tent, wearing all of my warm down gear, thick socks and wrapping mittened hands around steaming bottles of hot tea. 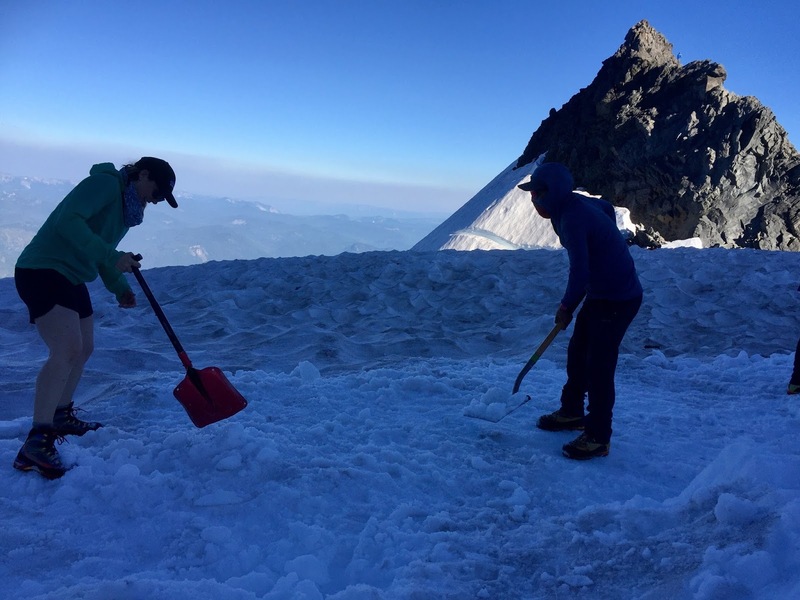 The following morning was spent basking in the warmth of the sun, eating and practising our crampon and rope skills in preparation for our early-evening departure from camp to the summit of Rainier. The weather was fabulous (hot!!) and it was nice to have some ‘down time’ away from the hustle and bustle of life at sea-level and everything that encompasses..! That evening we dined on the worlds tastiest burgers (kudos to the Lakhpa Gelu the chef!!) in the kitchen tent donated by IMG. No matter where I am in the world or what mountain I’m setting out to climb, I always get a rush of nervous excitement before a summit push. I think that’s both healthy and normal… The energy helps to prepare me both physically and mentally for the journey ahead. Dressed in down, with head-torches lit and smiles from ear-to-ear, we joined the snaking conga-line across the glacier and set out from our camp at 11pm on the warm August evening. At around 8am – after an evening of monotonous and steady high-altitude plodding, the summit of Mt. Rainier was in sight. Christa and I shared a rope led by Lakpa Rita. 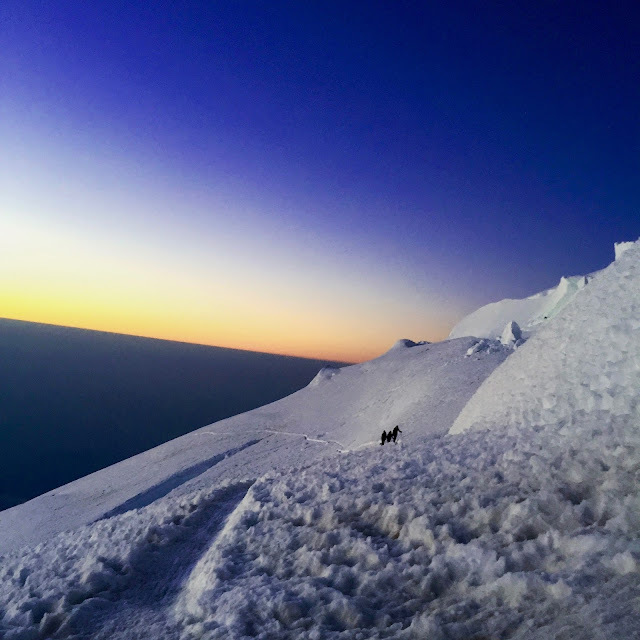 We were making a fantastic pace and stood breathless and mesmerized as the sun cast its early morning glow over Rainier’s snowy slopes around 6am. It was one of the most beautiful sunrises that I’d ever seen – (as documented by about 100 photos on my iphone and numerous unflattering selfies!!). Lakpa did a wonderful job setting the pace and keeping us focused during some of our more chatty breaks. 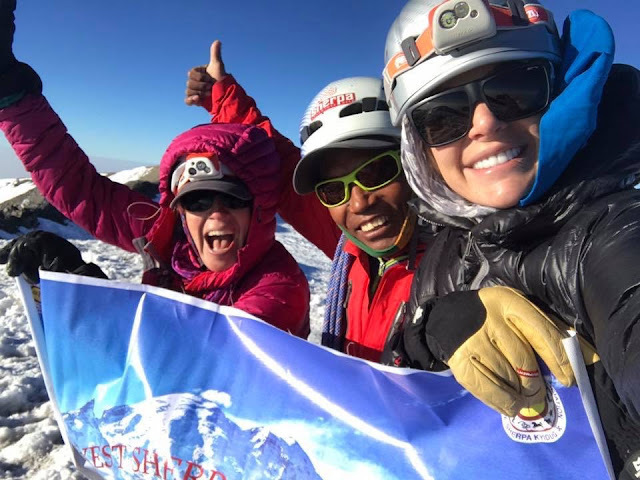 Reaching the summit of Rainier was a fantastic achievement - made even more special having done it with both Lakpa Rita and Christa…. Additionally, it was fantastic to have done it to support the Northwest Sherpa Association, a charity that I am both proud and honoured to support. We celebrated our success with some strategic selfies, laughs and snacks for about 45 minutes and welcoming other team members before making a hasty descent to avoid the heat of the day. The descent from the summit to the base of the mountain was one filled with rewards – a blazing sun, hair-raising glissades, laughter and the promise of a few beers over a momo-dinner before a flight back home. 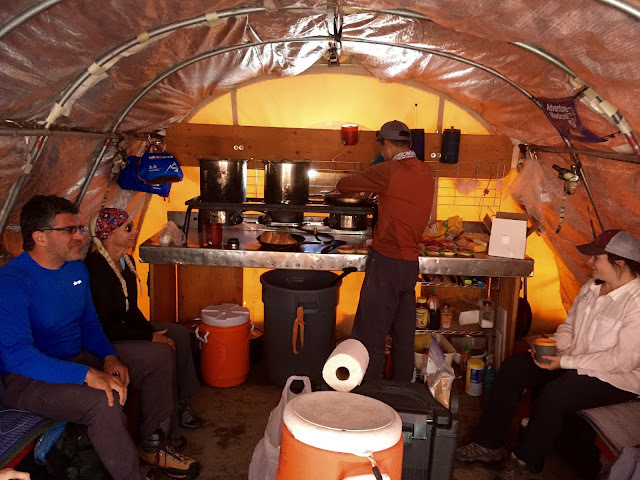 The successful Climb to Contribute expedition ended with a phenomenal team dinner at Lakhpa Gelu’s restaurant, “The Wildberry” (just outside of Ashford) and hosted by the Nortwest Sherpa Association. We were all absolutely exhausted but that didn’t stop us from celebrating the success of the first Climb to Contribute program under the leadership of our phenomenal Sherpa guides and friends. The closing dinner marked an important milestone in building a cultural and community centre for the Sherpas of the Pacific Northwest. The centre will be vital in helping preserve the language and traditions of the Sherpa people outside of Nepal and provide ‘base’ for a support network to new arrivals from Nepal and future generations. Climb to Contribute - how to sign up for next years adventure! Climb to Contribute is a 3 days and 2 nights trip to climb Mt. Rainier hosted by Northwest Sherpa Association. 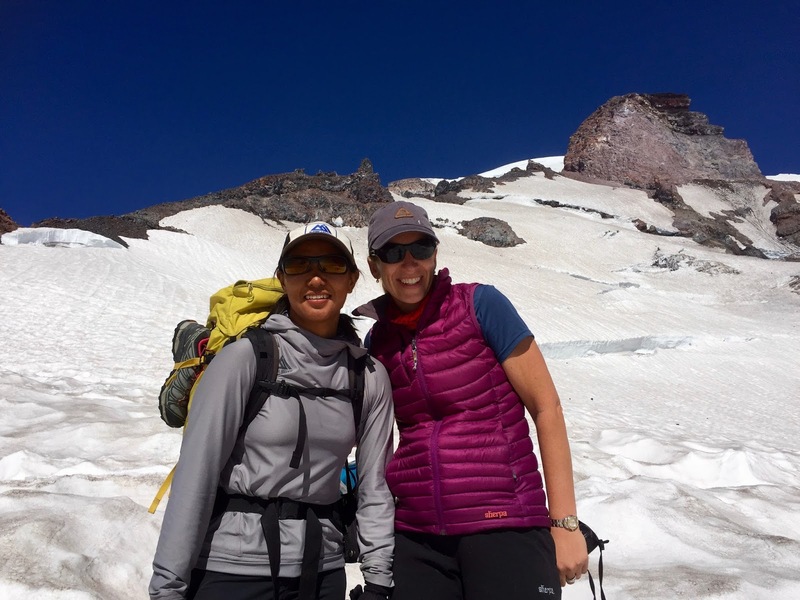 This is a once in a lifetime opportunity to climb Washington’s highest peak, Mt. Rainier guided by some of the most experienced and well known Sherpa Mountaineers; Mr. Lakpa Rita Sherpa, Mr. Lakhpa Gelu Sherpa and Mr. Jangbu Sherpa. 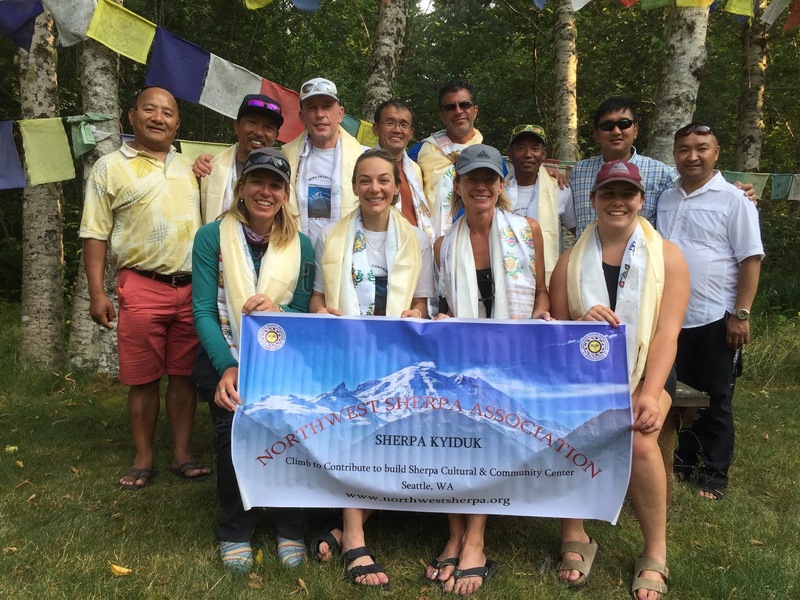 Northwest Sherpa Association is a non-profit organization, founded in 2003 with members from various parts of the Northwest region, including Vancouver B.C, Washington, Oregon, Idaho, and Montana. The mission of NWSA is to preserve and promote Sherpa language, religion, tradition, culture and unite all the Sherpas residing the Pacific Northwest of the United States of America including Oregon, Montana, Idaho, and Vancouver B.C., Canada. This is a fundraiser to support NWSA “Cultural Community Center” project. All proceeds from will go to build a NWSA Cultural Community Center.